After you’ve built your visualization in Tableau, you may want to play around a bit more to modify the view so that it looks just right. A few small changes can help to make sure your visualizations are not only clear and easy to understand, but also visually stunning. 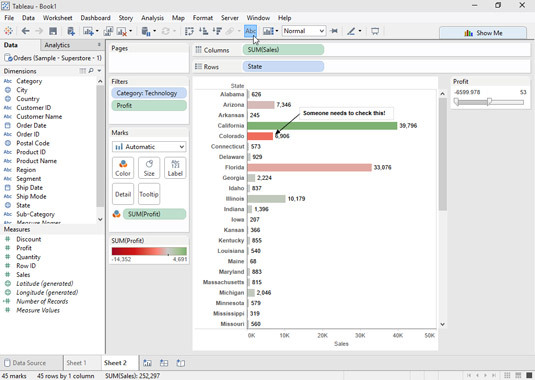 Tableau provides options to format your view to better convey the information to your audience. 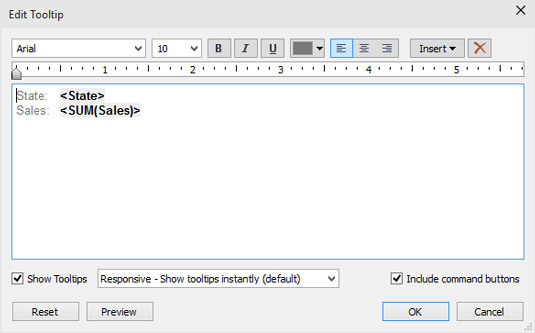 Use a Fit option on the toolbar: Use to determine the best fit for your dashboard. You’ll find Fit options such as Fit Width, Fit Height, or Entire View in place of the default Normal. 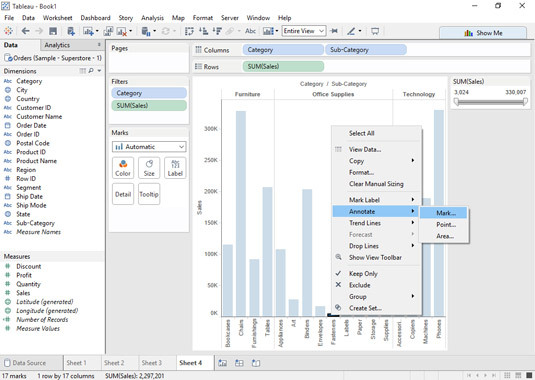 Group to a higher level of detail: Create a group of the low-ranking states to display their results in a single bar. Filter the results: Add filters to reduce the amount of data that might not be necessary. By showing Quick filters you can also start with less and allow your user to choose more only if desired. Use the Pages shelf: You could page through single time periods by dropping a Date field to the Pages shelf. Transpose: It’s often easier to read the axis labels when they’re horizontal rather than vertical. In this case, you’d want to put the State field on the Rows shelf rather than the Columns shelf. Click an encoding option to customize. You may also want to draw attention to a particular point, mark, or area in your view. One way to do this is to add an annotation to the view. Right-click the chart where you want to add the annotation. Select Annotate from the menu that appears. An annotation helps to bring attention to something important. Choose Mark, Point, or Area depending on whether you want to add the annotation to one of the marks, to a specific point, or to an area on the chart. You need to click on a mark to add a Mark annotation, but the Point and Area annotations can be placed anywhere in the view. 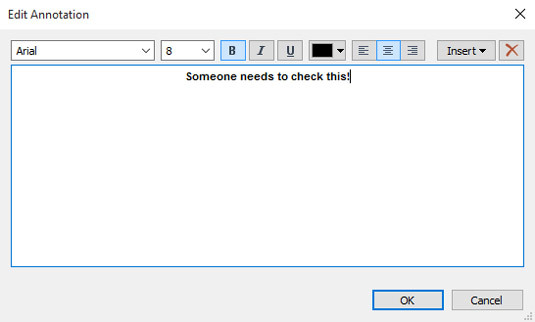 Create your annotation in the Edit Annotation dialog box. Click OK to add the annotation to the chart. If necessary, drag the annotation exactly where you’d like it to appear. Mark annotations have lines that always point to the mark; however, the text can move where you please within the view. Point annotations have lines and text that can move anywhere in the view as needed. Area annotations have a box that can be dragged around any section and is tied to the headers on the edges of the view. Mark labels make it easier to see the actual values.